It's intended to beat Aldi and Lidl on price, but Tesco's new 'Brexit bargain store' has left experts unsure about its potential as a fully fledged retail brand. Jack's was unveiled last week with two stores in Cambridgeshire and Lincolnshire, and up to 15 currently planned. The majority of its stock is own-label products under the "Jack’s" brand name and the supermarket also makes a point of talking up its British food sourcing. On price, meanwhile, Tesco chief executive Dave Lewis has said that Jack’s – named after Tesco founder Jack Cohen – aspires to be the "cheapest in town". Trying to compete with Aldi and Lidl on that basis was a fundamental mistake, brand consultant and retailer watcher Kate Jones said. "It’s going to be quite difficult for them," she said. "Everything looks really cheap and really ‘value’. Tesco seems to have created Jack’s based on the idea that people want cheap and cheerful; red logos plastered on everything; we support the working man on the street. That’s a nice story, but that’s not what the discounters are doing." In fact, the strategy employed by Jack’s looks more like that of Aldi and Lidl a decade ago, Jones said: "But no-one was really interested in them then." The two German retailers have achieved their rapid market share growth by offering a "full brand solution and quality service", she said. In contrast, what Tesco seems to be creating is "a brand that stands for cheapness – and that’s never a very good long-term idea". The launch felt "slightly underwhelming", Jim Prior, chief executive of Superunion, noted. "Being the cheapest is certainly not a dead end, providing you maintain the quality," he said. "But if you want to compete at the value end, maybe try and do it with a bit more pizzazz. The visual language is predictable – it’s an inauspicious start to a vague proposition." The decision of Jack’s to talk up its British credentials, with union flags all over the store, has led to suggestions that Tesco is consciously targeting a pro-Brexit demographic. It was a move with a certain amount of risk, Prior suggested: "I’m not sure anyone in the country knows where they stand on Britishness – there are so many questions wrapped up in that." But Rob Sellers, managing director at Grey Base, said this attribute provided a useful way for Jack’s to distinguish itself from Aldi and Lidl: "It allows them to offset the price conversation and give it a bit of a quality cue." British national identity remains "a key cultural signifier for a huge swathe of the population", Sellers argued. "I don’t think it’s about tubthumping nationalism – but being honest about what the business is going to do." 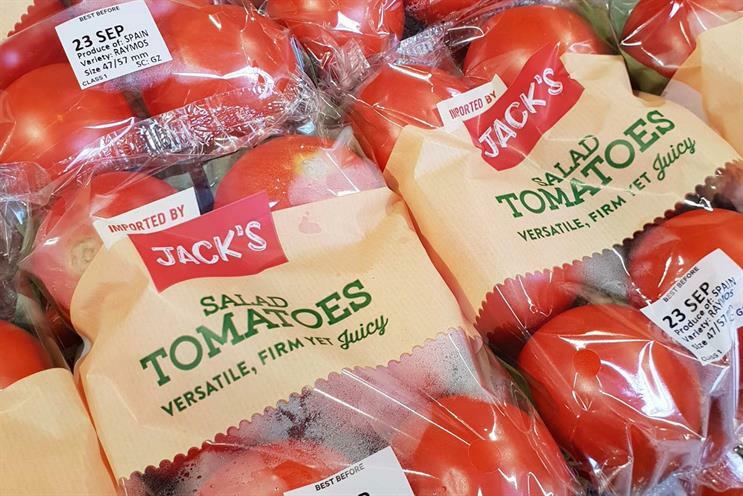 The decision to brand almost all of the product range as Jack’s, rather than to use a range of own-label names, as Aldi and Lidl do, was one way of keeping costs down, Sellers said. This thinking can also be seen in the design of the stores, which have unusually wide aisles. Tesco has said this is intended to make them easier and more enjoyable to shop in, but Sellers suggested it was to enable products to be restacked using greater automation, thus reducing staff costs. However, the approach also reflected major changes in the status of brands in the FMCG sector, Sellers said: "That mark of quality that a brand represents, what they call ‘worth paying more for’ – on the whole, that differential is being eroded." When the news of Jack’s was first reported last month, Prior suggested that the more interesting question was what its creation would mean for the parent brand Tesco – but the Jack's unveiling had not answered that question, he said. "It does create a very confusing brand architecture. Unless you’ve got a clear view where Tesco is going to go, Jack’s makes less sense," Prior said. Rather than trying to build Jack’s into a retail chain, Prior explained, Tesco should use the new brand to replace the value-tier "farm brands" that Tesco has introduced for its fresh produce that have come in for some criticism. "I think the ‘fake farms’ are inauthentic and slightly dishonest, and I really feel they go against the grain of what a strong and reputable brand ought to be doing," he said. Jack’s, in contrast, is a "great name – it’s accessible, it’s easy, it ties back to the heritage". Jones agreed that Jack’s is unlikely to have a future as a truly "stand-alone offer". She could imagine Tesco introducing Jack’s as a sub-store or section within Tesco stores, while the initial Jack’s stores could have a role as a working lab for "testing a more flexible retail solution". If Tesco is aiming to grow Jack’s into a major chain in its own right, "they’re going to have to nail value and Britishness, and then they’ll start to bring in higher-ticket items", she said: "That aisle of weird stuff that Aldi and Lidl sell, for example – that’s stuff Tesco could procure very effectively."